“A friend that is so easy to talk to”, that is how our patients view Jamie. 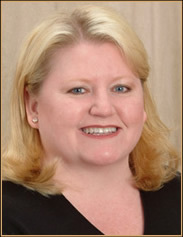 Our Office Manager since 2002, Jamie has been providing outstanding service to our patients. From assisting patients with maximizing their dental insurance benefits, to working out comfortable financial arrangements, Jamie knows that concerns over health care costs can prevent people from seeking the treatment they need or want. Jamie is always happy to discuss treatment fees, insurance and financial arrangements with our patients in an open, caring manner. In our practice, we want no financial surprises or hidden costs for our patients. We never want finances to stand in the way of excellent patient care. Jamie’s primary concern is helping people get the dental care they want in a comfortable, affordable way. A native of Bloomington/Normal, her hobbies include cooking and spending time with family and friends.